*WANDERLUST COLLECTION* Make a super cute bangle with Swarovski rivoli crystals and matching seed beads. This design is the perfect accessory to wear to a spring wedding or a special occasion. 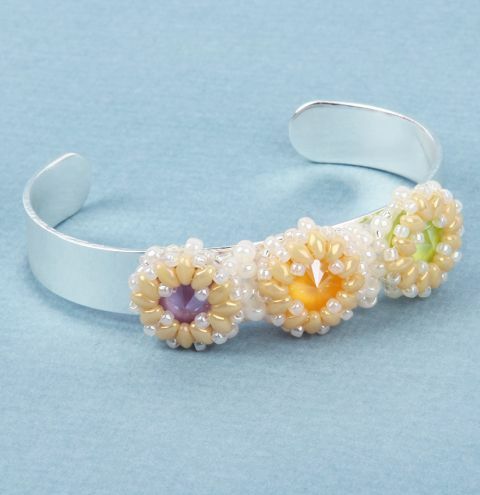 Follow the video tutorial in the step by step project below to make each of your flowers and then follow the written instructions to attach them to your bangle. Follow the first section of the video tutorial in the link below to make 3 of your flowers and then follow the written instructions to attach them to your bangle. The first 13 minutes of the video show you how to make one of your crystal flower shapes. Make 3 of these with one of your 3 different Swarovski crystal rivoli in the middle of each. Once you are happy with your 3 beaded flowers, cut a 1 metre length of thread and thread it into one of the flowers. Weave around a few of the beads and exit through one of the seed beads on the back of the flower. Pick up a size 11 seed bead. Thread through a hole on your bangle base. Thread across the bangle width of the base and thread up through an adjacent hole. Pick up a size 11 seed bead and thread back into the underside of the flower. Thread across the flower a little and repeat this process to attach the other side of the flower to the bangle. Thread around this flower again and reinforce the connection to the bangle base. When you are sure it is secure, thread out of the flower through one of the size 8 seed beads on the edge where you will attach your next flower. Pick up 3 x size 8 seed beads and thread into the bangle base. Thread up through a hole on the other side of the hole in the bangle. Pick up 3 x size 8 seed beads and thread back through the same size 8 bead attached to your flower. Thread around and back up through the 3 seed beads again. Thread through a size 8 seed bead on the edge of another flower. Thread down through the other 3 seed beads you added before. These 6 seed beads fill the gap between the two flowers. See the close up image. Weave around a few of the beads on your second flower and exit through one of the seed beads on the back of the flower. Pick up a size 11 seed bead. Thread through a hole on your bangle base. Thread across the bangle width of the base and thread up through an adjacent hole. Pick up a size 11 seed bead and thread back into the underside of the flower. Thread across this flower and repeat this process to attach the other side of the flower to the bangle. Thread around this flower again and reinforce the connection to the bangle base. When you are sure it is secure, thread out of the flower through one of the size 8 seed beads on the edge where you will attach your next flower. Repeat the process of adding 3 seed beads on either side of the seed bead you exited from on your flower. Then attach your 3rd flower as you did in step 5. Attach your 3rd flower and add size 11 seed beads underneath it as you have done before to the previous flowers. Weave your thread around the back of the flowers and into the bangle base to secure them as well as you can. Create knots along the way to secure further and once you are happy your work won't unravel, trim off your excess thread. Do the same to any tail threads to hide them within your beadwork.